At least in India, most of us have heard of the Bael (Bilva) tree. The Bael tree has a religious significance attached to it. With a wise motive, our ancestors probably thought that if at all they attach an aura of religious sanctity to precious herbs and trees, the future generations, fraught with a feeling of reverence, will feel the compulsion to preserve and cherish them. But are we doing that? No!! Indiscriminate felling of trees and wide spread deforestation is rampant, resulting in the loss of rare flora and fauna. The consequences of this merciless assault on nature by man to meet his immediate selfish needs will prove to be disastrous in the long run and backfire on him. Global warming, natural disasters, environmental pollution, ozone layer depletion - all these are the results of man’s insensitivity towards Mother Nature. So all of us should act now and do our bit to save the environment. Let’s go green before it is too late. Now coming back to the topic of bael tree. Religious implications aside, let’s just not disregard its various other benefits, , its medicinal uses and the various home-remedies that it is used for! Having this tree in our surroundings cleanses and purifies the atmosphere. Almost all the parts – roots, leaves, fruit, and barks have a medicinal value. 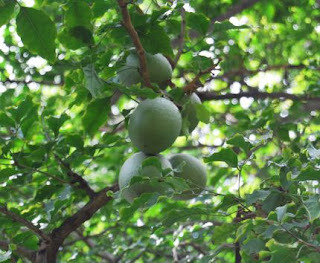 The Bael fruit, which is also called as wood apple is very hard and it has to be broken open to relish its juicy insides with zest. 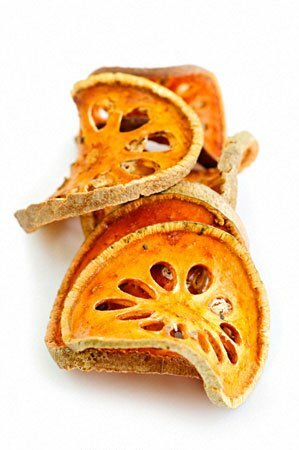 Buy Tops Dried Bael Fruits 100 G. Thailand Product from Amazon. what a wonderful post! Thanks for all the info about Bael. # Bael has a high tannin content which makes it an effective cure for dysentery and cholera. There is as much as 9% tannin in the pulp of wild fruits, less in the cultivated types. The rind contains up to 20%. The leaves also contain tannin. # Bael is beneficial in the digestive system and it is also a mild laxative. # A decoction of the unripe fruit with ginger and fennel is said to be effective for the treatment of hemorrhoids. # The juice of its leaves mixed with honey, can relieve catarrh and fever. # The pulp is used in the treatment of Vitiligo. how should we use this bilva leaves or fruit for sagging sking and vitiligo? Effective in constipation, diarrhea ,dysentery and peptic ulcer. 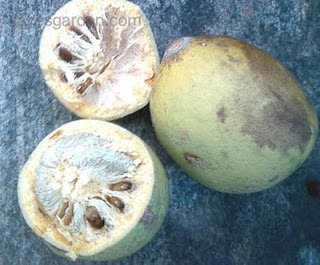 Ripe bael fruit is regarded as best of all laxatives. It cleans and tones up the intestines. For best results. it should be taken in the form of sherbet. The unripe or half-ripe fruit is perhaps the most effective remedy for chronic diarrhea and dysentery where there is no fever. can BILVA leaves be used for weight reduction? I really don't know if it helps with weight loss. If someone could enlighten us on this, it would be great.